Union Bank of India had Released the UBI Armed Guard Hall Ticket 2019 for the online examination on their official website. 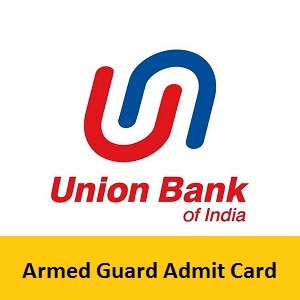 So you can now download Union Bank of India Armed Guard Admit Card 2019 @ unionbankofindia.co.in. All the aspirants can apply for the post of Union Bank Armed Guard. Once you are done with the application process, you need the Union Bank of India Armed Guard Admit Card 2019 to attend the examination. However, candidates can use the quick link enclosed on this post to acquire UBI Armed Guard Hall Ticket 2019. Furthermore, we have also furnished you the details regarding details present on UBI Armed Guard Hall Ticket 2019 and required documents to carry for the Examination, selection process and steps to download the Union Bank of India Armed Guard Admit Card 2019. These are the details mentioned in the UBI Armed Guard Hall Ticket 2019 which helps as a gate pass for all the candidates. So check whether the details mentioned in the Union Bank of India Armed Guard Call Letter 2019 are related to you and also check for any other mistakes So that it won’t trouble in the future verification process. By aggregating to a Total Score of 100. Online Test shall be made available in English and in the Hindi language. First, move on to the official website of Union Bank of India. scroll down the home page, you will find Recruitments, then click on it. Now you can go to “CAREERS OVERVIEW“. Click on the mentioned link to view current Recruitment. Now you will get on to “RECRUITMENT” page. search for the desired link named with Union Bank of India Armed Guard Admit Card 2019. Click on it and fill the required details for Union Bank of India Armed Guard Admit Card 2019 @ unionbankofindia.co.in. Moreover, we advise you to regularly keep in touch with our official website from time to time for details, announcements, updates and any information which may be posted. furthermore, keep login with us on Fresher Now, so that you will not miss you any important information regarding Union Bank of India Armed Guard Admit Card 2019.